In about two weeks I’m yet again heading to the US. After months of monitoring prices, the flights are booked, car rental largely sorted and even hotel for the first night is booked. I have to admit that I enjoy all those preparations almost as much as the travel itself. It is practically extending the actual holiday as during the last few weeks I’m really getting focused on my destination. It is always the case. 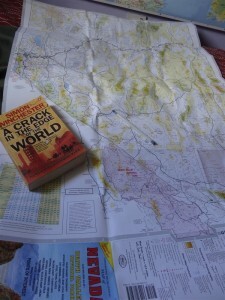 I start reading guidebooks and travel literature connected to my destination and spend a lot of time staring at maps. This year we are heading to San Francisco where we are going to start our road trip across quite a few western states. Luckily one of the books which was for years collecting dust on my shelf is Simon’s Winchester A Crack in the Edge of the World. It is a perfect read before the trip we planned. I’m half way through it and I really enjoy it. It is not just account of the great earthquake which destroyed SF in 1906, it is also a great introduction into complicated tectonics of California. In short, a perfect book for anyone heading there who is even vaguely interested in geology and geography of the region. Of course I also keep browsing a dozen or so guidebooks at the same time. When I’m not reading I keep researching things online. Nowadays with Google maps and Google street view you can practically do your trip before you even leave your living room. Of course it would be spoiling the fun but it is handy to check how to drive out of the airport and where to stop in San Fran. I already know the SFO (San Francisco International Airport) layout and how to get from car rental place onto the freeway and then how to get to Twin Peaks which suppose to offer great panorama of the city. I also used online maps and search tools to find a decent hotel next to the BART (Bay Area Rapid Transit) station so we can leave our car in the hotel as parking in San Francisco is a real pain. Believe me I was there more than once. So this time I picked a hotel in Berkeley just a few minutes from the BART station which in 20min should take us to downtown San Francisco. I chose Berkeley because hotels there (unlike most in SF itself) don’t charge for the parking. It will also make our journey inland easier after finishing with the Bay Area. All the above considerations might sound boring and mundane but I really enjoy this research stage of planning. It is fun to look at some strange random neighbourhoods where you would otherwise never go just because you are checking a hotel you found on one of the many prise comparison sites. After San Francisco we are going to cover quite a lot of ground driving quite a few thousands of miles before flying back to London from SFO. Again, it is fun to plot all the possible routes and think how far can we go before we have to head back. I always have a lot of ideas plotted on maps (both, paper and digital) but still end up doing something completely different altogether. Because it is important to remember that all this planning are largely just ideas. As much as I love planning I also love changing my plans based on weather, local recommendations or just random finds. That’s how I ended up in Idaho Potato Museum a few years ago, I just spotted a directional sign on the side of freeway. On another occasion due to rainy weather on the Oregon coast I ended up heading inland and visited an absolutely stunning Crater Lake NP. This time as well, I have pretty clear idea where we heading but I also know that further we progress into out trip the more our actual route will be different. It always the case, for a day or two, or even maybe three, I stick to my plans but then things just keep changing. And I’m sure it will be the same during this trip but it still doesn’t stop me from planning, plotting and researching. This entry was posted in Uncategorized and tagged BART, Berkeley, maps, planning, San Francisco, SFO on September 8, 2013 by admin.